The brass family consists of 5 major instruments with many other similar variations on them. The Trumpet/Cornet, the French Horn, the Trombone, the Baritone/Euphonium, and the Tuba/Sousaphone. Sound is produced by each instrument in the family by buzzing the lips together into the mouthpiece. These instruments are a part of the band program, along with the woodwinds family and the percussion family. The Trumpet and Cornet are two different instruments but their differences are so trivial, beginning band teachers don´t distinguish between the two. These instruments are the highest and smallest members of the brass family. The French Horn is a brass instrument somewhat larger than a trumpet so its pitched lower. It´s a beautiful sounding instrument but beginners should be aware of a serious difficulty with learning to play the French Horn. The Trombone, unlike the French Horn and Trumpet is considered 'low brass' and reads from the bass clef, opposed to the higher treble clef that is read by the higher instruments. The trombone is a brass instrument with a unique feature. 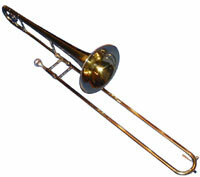 Rather than valves or keys that are pushed with the fingertips, the trombone uses a slide to change pitches. The Baritone and Euphonium are two seperate instruments but the difference is minor and not important for a beginning band student. 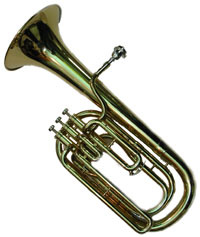 A baritone or euphonium can be considered a double sized trumpet or a half sized tuba. The Tuba and Sousaphone are two seperate instruments but the difference is minor and not important for a beginning band student. 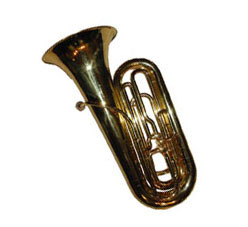 They are the largest and lowest instruments of the brass family.